This is very different from my usual Blog Posts, but I hope you will find the subject as fascinating as I have found it. The “Big Bang” story of the start of the Universe 14 billion years ago is rather dull: there was nothing and then in less than a microsecond later there was everything. 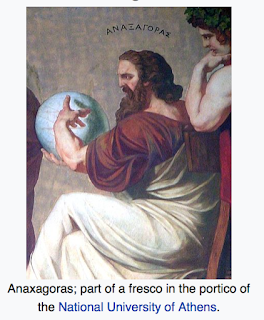 The Book of Genesis is much more interesting; it says the same thing but with a longer time-scale. 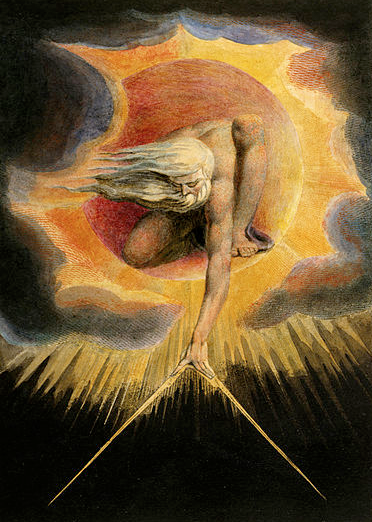 There are countless other similar and imaginative creation stories composed by the many groups of people in the world. After or during creation, “everything” had be be remodelled into things that we can see and things that we cannot see – matter and anti-matter, visible energy and dark energy. The Earth itself appears to have been created 4.5 billion years ago, and a lot has happened since then. 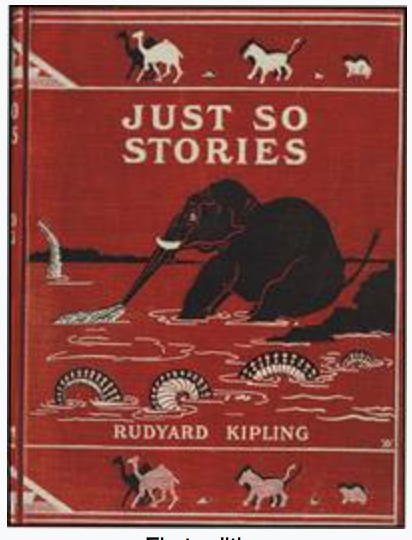 “The Just So Stories” (Rudyard Kipling 1865–1936) have given colourful suggestions of the evolutionary origins of some advanced animal species, but these would have been in comparatively recent years. The great mystery is how and where life itself originated. 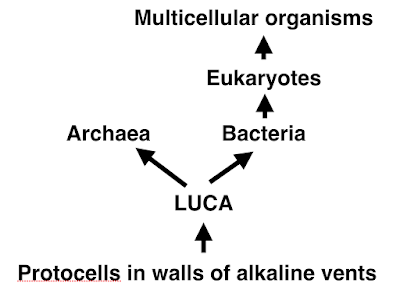 Eukaryotes (cells with nuclei), the cellular building blocks of the advanced forms of life, appeared about 1.6 billion years ago. Before this, there were just bacteria and archaea, discovered only recently. 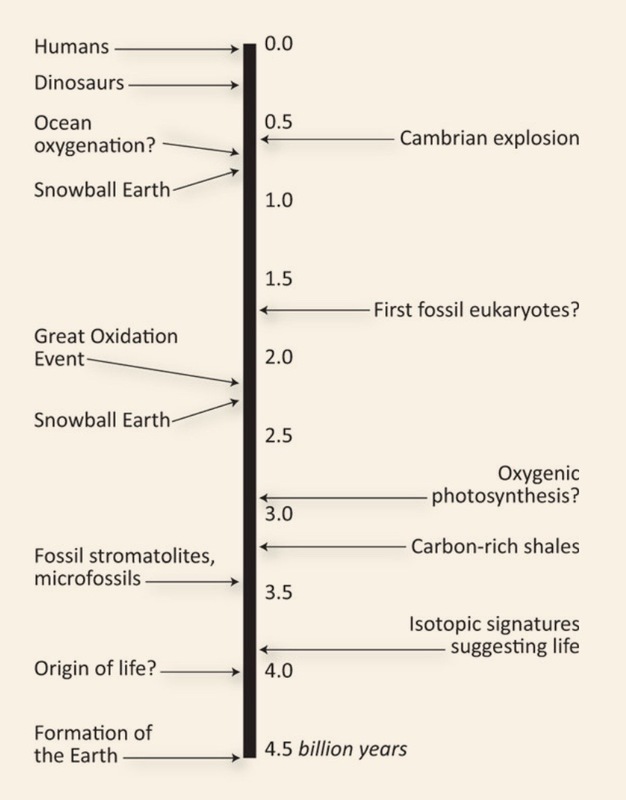 But life had its very earliest origins 4.5 billion years ago. There is a suggestion of panspermia, the seeding of life from comets into a receptive Earth environment, bringing the fundamentals of life from great distances. The concept of panspermia has its origins in the 5th century BC writings of the Greek philosopher Anaxagoras, with further suggestions in the 19th century. Fred Hoyle (1915–2001) and Chandra Wickramasinghe (born 1939) have proposed panspermia in modern times. Hoyle and Wickramasinghe have suggested that recent pandemics of “flu” might have been due to viral DNA or RNA seeded from comets. This is an interesting but untestable hypothesis. An acceptance of panspermia only begs the question of the mechanism of the origins of life elsewhere. It also acknowledges that evolution still had to take place on Earth: man and other advanced animal life could hardly have arrived by cometary transport. 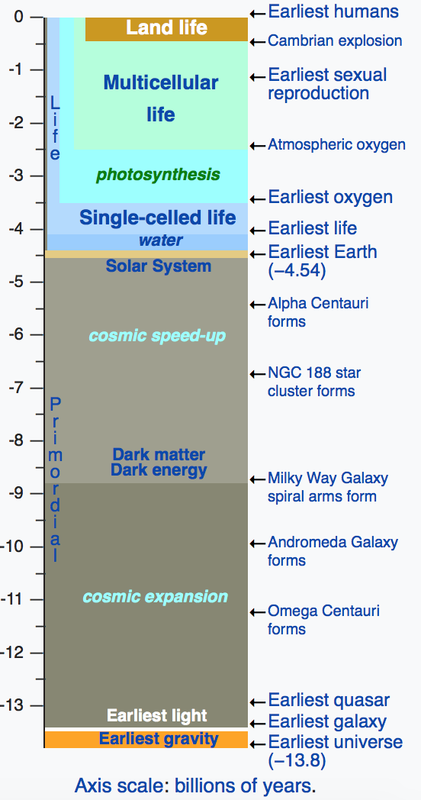 Although panspermia cannot be excluded totally, it is perhaps more likely that life on Earth originated on Earth. Zircons are usually tiny mineral deposits less than a millimetre in diameter, but there are lager examples that can be fashioned into attractive jewellery. The important thing about zircons is that they can be dated back to times shortly after the creation of the Earth. The chemical composition of zircons is basically zirconium silicate, ZrSiO4. 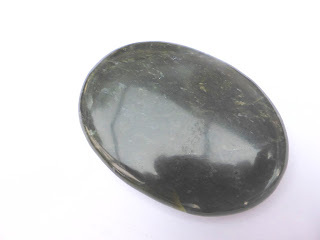 However zircons contain several impurities, which give the gem-stones a variety of colours. One of the major impurities is uranium. This is of course radioactive and it decays to lead. The more recently the zircon was formed, the higher the ratio of uranium to lead. But in practice the ratio of lead is high, indicating a very ancient time for the formation of zircons. They can be dated to the very origins of the Earth. The detailed analysis of zircons indicates that at the time of their formation, more than 4 billion years ago, the atmosphere contained water vapour, nitrogen and carbon dioxide. There was between 100 and 1000 time as much carbon dioxide as at present, as there was of course no plant life to absorb carbon dioxide and to release oxygen. Oxygen is a highly reactive element and all oxygen was in the form of oxides of carbon, hydrogen, and many metals. There was ample liquid water, indicating that temperatures were similar to what they are today. There have been many major cataclysms disrupting the surface of the Earth and its atmosphere, but the sea bed remained much more stable. 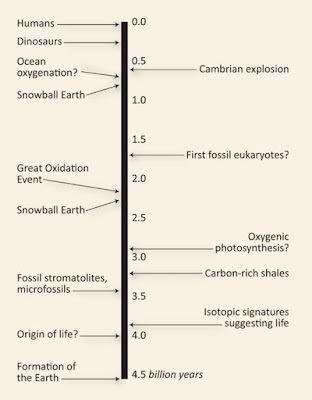 The formation of life had to start off with the components that were already present 4.5 billion years ago. Life is fundamentally composed of carbon, hydrogen, oxygen and nitrogen. These are available as combinations in the forms of water (H2O), carbon dioxide (CO2), methane (CH4) and nitrogen. 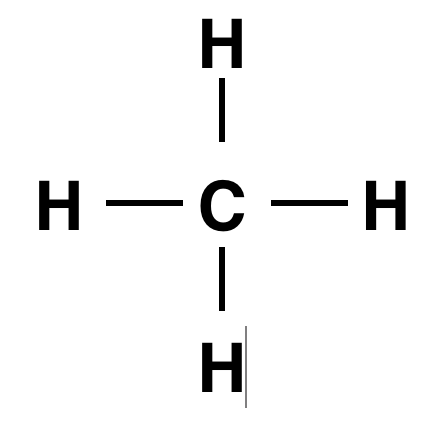 Nitrogen is found as a gaseous atomic dimer (N2), which is free in the atmosphere. Oxides of nitrogen (NO, NO2, N2O) are gaseous but form solid compounds as nitrates and nitrites. 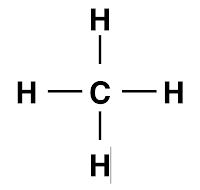 The other important simple compound is hydrogen sulphide (H2S), which is a gas at a temperature of the freezing point of water. 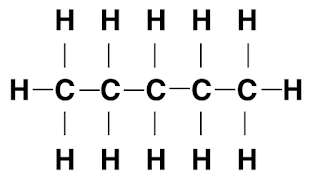 Water (H2O) is unique as a simple low molecular weight compound, being in liquid form at ambient temperatures (20–40 degrees Celsius). At normal atmospheric pressure it becomes a gas at the relatively high temperature of 100o Celcius. Carbon, hydrogen and oxygen will form fats and carbohydrates (sugars). Nitrogen is necessary in addition to form amino acids, the basis of proteins and nucleic acids (RNA, DNA). All these constituents were readily available 4 billion years ago, as they are today. It is likely that they have been available on other planets. But more than just the atomic building blocks of life were necessary for life to begin. Two other things were necessary for simple organic molecules to be created, and for them to be assembled into complex molecules. Life is composed of simple sugars, fats, amino acids and nucleotides, but these must be polymerised, built up into long chains. Polymers of glucose form starch as an energy store in plants, glycogen as a similar energy store in animals, and cellulose, a structural polymer in plants. 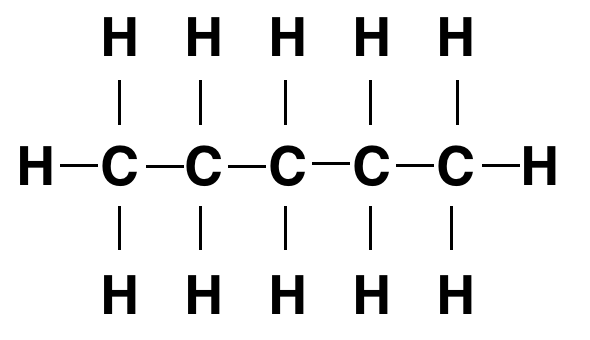 Various long-chain fats are polymers of methane. Complex proteins are polymers of amino acids. DNA and RNA are polymers of nucleotides. For the synthesis of simple and then complex organic molecules, a source of constant energy was necessary. 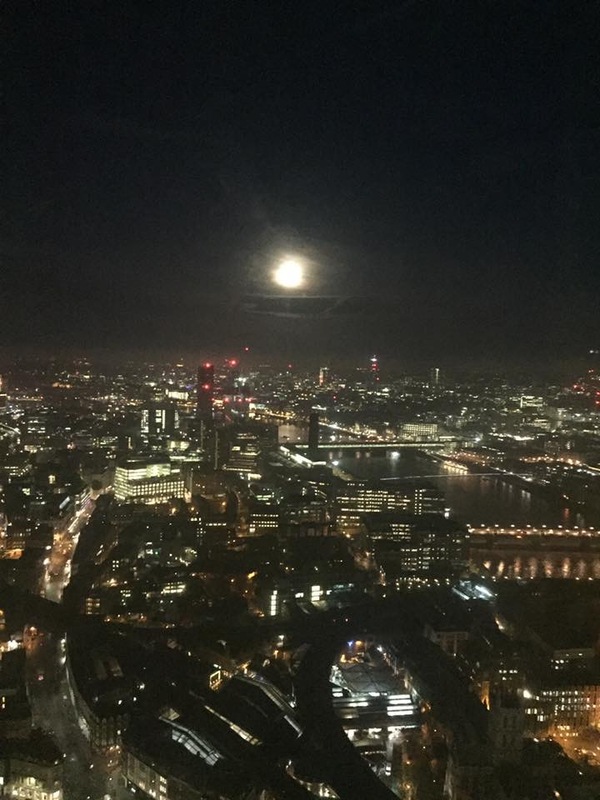 There has been the suggestion that life started from an atmospheric chemical “soup” with the energy input being from flashes of lightning. However lightning does not provide the constant and manageable energy flow that would have been necessary. The surface of the Earth would not have been sufficiently stable for life to develop, and zircon analysis indicates that the atmosphere would not have been suitable. The source of constant energy has been found in structures deep in the oceans. It is now thought that life started in deep sea alkaline vents. These are not the superheated hot smokers that we are more aware of, but rather less dramatic structures that have been discovered more recently. Water at moderate temperatures emerges from deep sea alkaline vents into rock structures with heights up 60 meters. The most famous of these structures is known as “Lost City”. The important features are that the water emerging is not very hot, is alkaline, and contains dissolved hydrogen and methane. 4 billion years ago the sea was much more acid than today, as the result of much more carbon dioxide in the atmosphere. Lost City and similar alkaline vents are high towers of a sponge-like arrangement of the mineral olivine (Magnesium Iron Silicate). 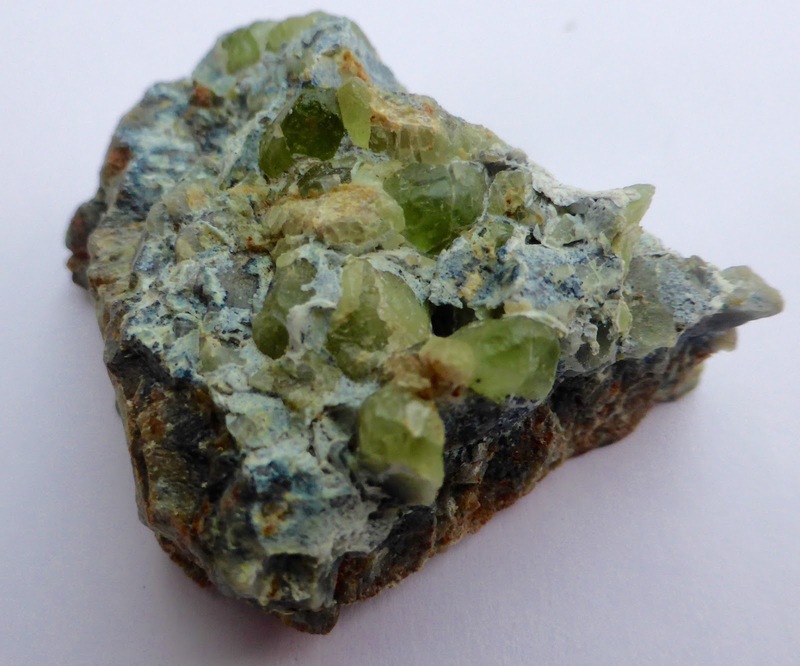 Olivine is hydrated into serpentine, a common mineral that polishes well and has been used in many buildings, such as the Empire State Building. 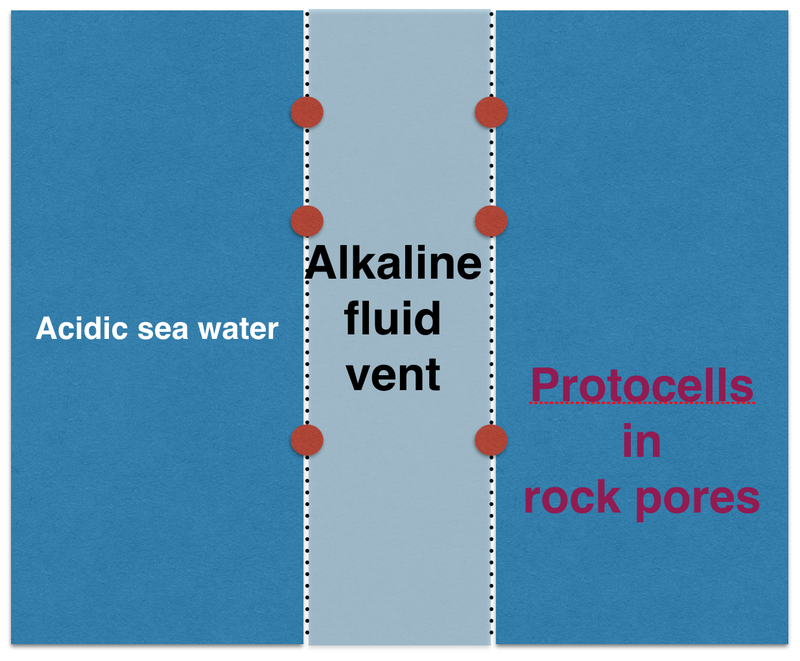 Alkaline water with pH 9–11 percolated through a sponge-like matrix, with at the time acid sea water with pH 5–7 on the other side of the porous rock plates that make up the “sponge”, rock as thin as one micrometer. This separation of acid and alkaline created an electro-chemical gradient, not unlike a battery, with a difference of proton concentration 1,000 to 100,000-fold. This was the constant source of energy that was necessary for the creation of organic molecules and ultimately life. 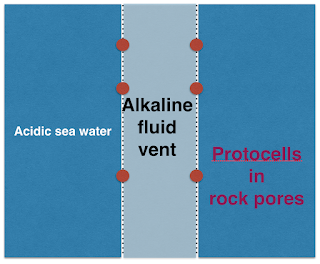 This was the environment in which "protocells" (the forerunners of free-living cells) developed within the pores of the thin rock plates of the sponge matrix. The second necessity to enable a chemical reaction to take place is a catalyst, something that accelerates a chemical reaction but is not consumed by it. This is provided in the alkaline vents by the many metals that are found within the rock, in particular iron. Many other metals such as nickel and copper also act as catalysts. Think also of platinum in the catalytic convertor of a car exhaust system. 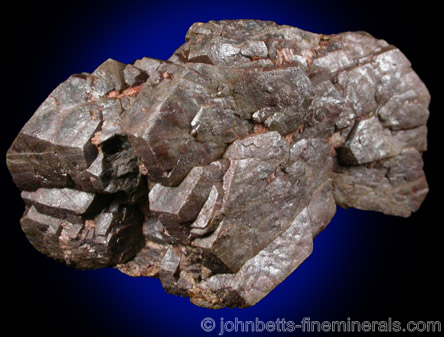 Tiny metal clusters became incorporated into the rock and in particular into the walls of the pores in the rock. They were thus in a strategic position to catalyse chemical processes. As organic life developed the iron (and other metal) atoms became incorporated into highly complex protein enzymes, enzymes being biological (organic) catalysts. They are still within us today, the metal atoms from the very beginnings of life. An example is the iron atoms at the core of the complex protein haemoglobin, which carries oxygen within our blood. The complex proteins that make up enzymes are concerned mainly with the flow of negatively charged electrons and positive charged protons (nuclei of hydrogen atoms). This is fundamental to the control of electro-chemical energy within living organisms. Although magnesium and iron are the most common metals to be found in the important olivine and serpentine rock, nickel, aluminium, zinc and manganese can also be found in the silicates that make up the serpentine family of minerals. They all add to the range of catalysts, becoming essential trace-elements incorporated into the complex enzymes that were synthesised throughout the evolution of a wide range of life forms. It was the Dutchman Albert Kluyver (1888–1956) who demonstrated that similar biochemical processes are present from “bacteria to elephants”. 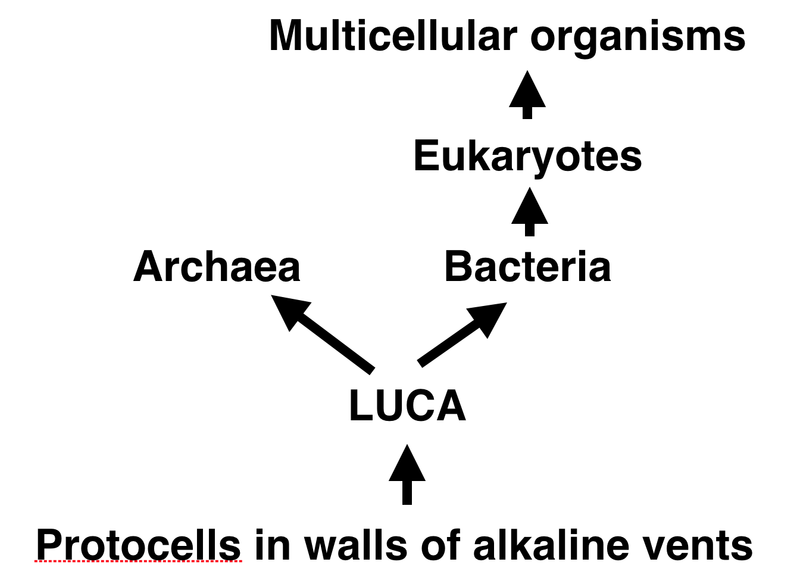 LUCA was the Last Universal Common Ancestor of all life today, the great and unlikely accident in the development of the Earth. LUCA was formed within the serpentine based sponge-like rock of the alkaline vents. It was not free living, but it was an entity that had become metabolically active. Its later developments were along two distinct and very long pathways, the bacteria and archaea. Their antecedents could only be released from the rock once they had developed protective cell walls. They also required metabolically active energy systems to replace the energy supply that sustained LUCA in the alkaline vents. In addition they required the more complex enzymes and genetic control proteins. These developments occurred during the course of half a billion years. Cell walls were developed from droplets of oil, a relatively simple process involving the polymerisation of methane and also its hydroxylation to glycerol. The cells later absorbed what were initially free-living entities and these added much to the cell function. They included: ribosomes, for protein synthesis; mitochondria, for energy production; cyanobacteria, to enable photosynthesis in plants; spirochaetes, to form flagella that enable motility. 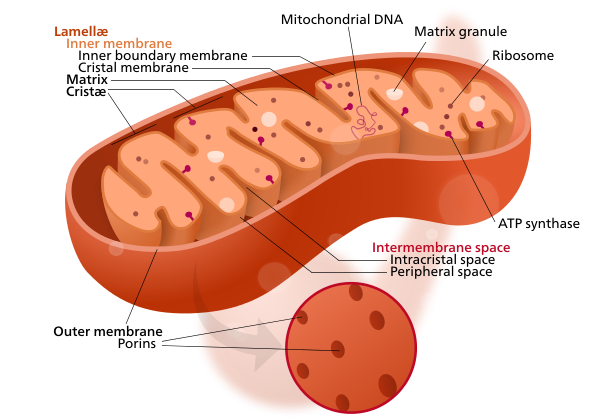 Mitochondria transformed cellular life through a huge increase in energy production. Without mitochondria complex life could not have developed. Mitochondria were initially free-living bacteria that developed membranes that enabled the production of large amounts of energy. This was through the Krebs cycle of energy from the oxidation of glucose the energy being stored as ATP (adenosine tri-phosphate, a simple organic compound), with water and carbon dioxide as waste products. The next stage was endosymbiosis, mitochondria becoming incorporated within cells for mutual benefit. A cell can contain up to 40,000 mitochondria, which reproduce to enable cell division without mitochondrial loss. The complex protein enzymes of mitochondria include atoms of iron from the earliest origins of life. Imagine 4 billion years after the creation of life, 40,000 mitochondria in each of 10 trillion cells in our body. "There is an electrochemical potential difference across the membrane, in the order of 150 to 200 millivolts. Because the membrane is very thin (around 6 nm thick) this charge is extremely intense across a short distance.... the field strength is 30 million volts per metre, equal to a bolt of lightning, or a thousand times the capacity of normal household wiring." Interesting new research has investigated the role of mitochondrial “down-regulation” in mammalian hibernation, with a shut-down of energy and heat production. There is great curiosity concerning what can restore (switch on) normal mitochondrial function, and this is relevant to human illness in which there might be mitochondrial down-regulation. Studies of hibernating mammals suggest that hydrogen sulphide (H2S) might be responsible for inducing hibernation and for reactivating mitochondria. Other functions of hydrogen sulphide are also suspected. This is relevant to the origin of life four billion years ago as hydrogen sulphide is a simple gas, common and present undersea geothermal vents, especially in the “smoking chimneys”. However today it appears that hydrogen sulphide is produced in the body from the sulphur-contianing amino acid cysteine. Incidentally, I before retirement I had great interest and considerable experience in patients with chronic fatigue syndromes (CFS, ME, SEID). I came to understand that the basis of the illness was a physiological down-regulation of mitochondria during an acute illness, but failure of restoration of normal mitochondrial function when the acute illness (usually infection) had settled. I had no curative treatment to offer, but the recognition of the importance of hydrogen sulphide might well provide a therapeutic opportunity in the future. 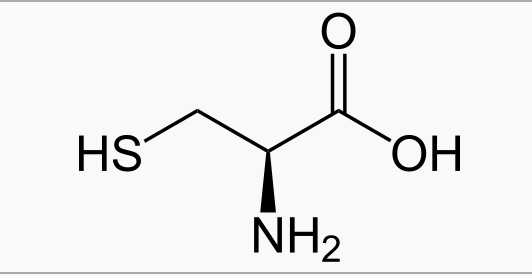 Nitric oxide (NO) is another simple gas with early origins that has important physiological actions today. One is the control of blood pressure and other cardiovascular effects. Nitric oxide is produced in the body by the action of sunlight on nitrates from the diet, as the blood circulates through the skin. This is one reason why the sun has effects greater than can be observed from vitamin D supplements. 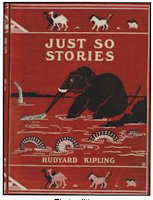 But these are different stories. The important message from this Post is to draw attention to how life was originally formed from the interaction of water and rock. Our complex biology is based on simple inorganic origins that remain of great importance today. 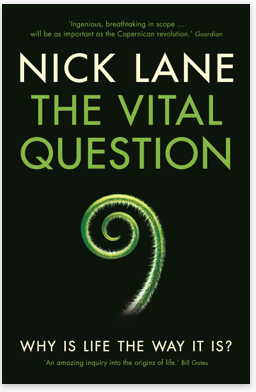 The writing of this Post would not have been possible without the information contained in the remarkable book "The Vital Question", by Nick Lane, Reader in Evolutionary Biochemistry, University College London. I recommend it to those with a deeper interest in the subject of the inorganic origin of life. Congratulations David on a very fine exposition of the latests ‘state of the art’ interpretation of life’s evolution from the inorganic. You extended my own awareness of endosymbiosis beyond mitochondria and chloroplasts by adding spirochetes and ribosomes as examples. You have probably read my own posts about hybridisation and although these historical symbioses are not examples of hybridity they are examples of genes passed on between different organisms and in my view conflict with the evolutionary mantra that evolution is a straight line. I was fascinated to read again about that remarkable substance ATP. I was also interested in your aside from your own medical experience of chronic fatigue syndrome. A relative of my wife suffers from an unnamed (to us) fatigue syndrome that the medics have no explanation (to us). I have always wondered whether it was related to mitochondrial function.